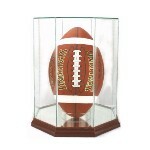 This is the football display cases category. 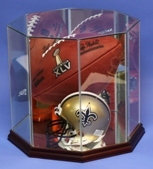 In this category, you will find single football display cases, vertical football display cases, horizontal football display cases, double football display cases, football helmet display cases, double football helmet display cases, mini football helmet display cases for 1 helmet, 2 helmets, 3 helmets and more. 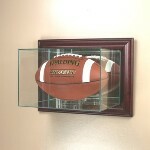 We have wall mountable and desktop display cases. 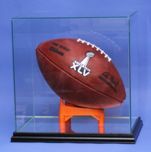 THIS REAL GLASS MODEL REPLACES THE PREVIOUS ACRYLIC MODEL. 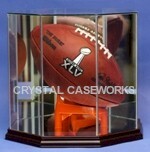 Glass display case designed to hold 1 official NFL NCAA size football end zone goal line pylon. 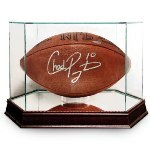 standing up or laying down on it's side. 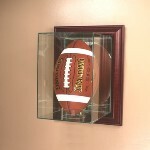 Comes with 1 free laser engraved name plate. 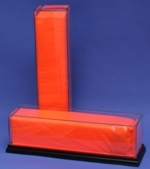 Inside dimensions can accommodate a 4" x 4" x 18" pylon. 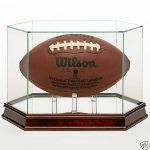 This is the same as our popular FOOTBALL-201 but with custom pylons instead of the round ring to hold the ball off the floor.